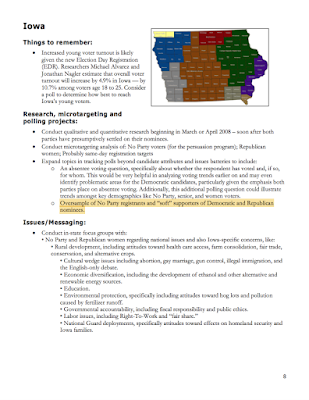 Yet another in a long line of emails from the Democratic presidential candidate's camp gives us an inside look at political polling and how it has been corrupted. Polls, even with their questionable accuracy, can be very persuasive voter motivator during an election; some voters will choose not to vote because their candidate looks like a shoe-in while others will choose not to vote because their candidate is so far behind that they feel as though their vote won't matter. 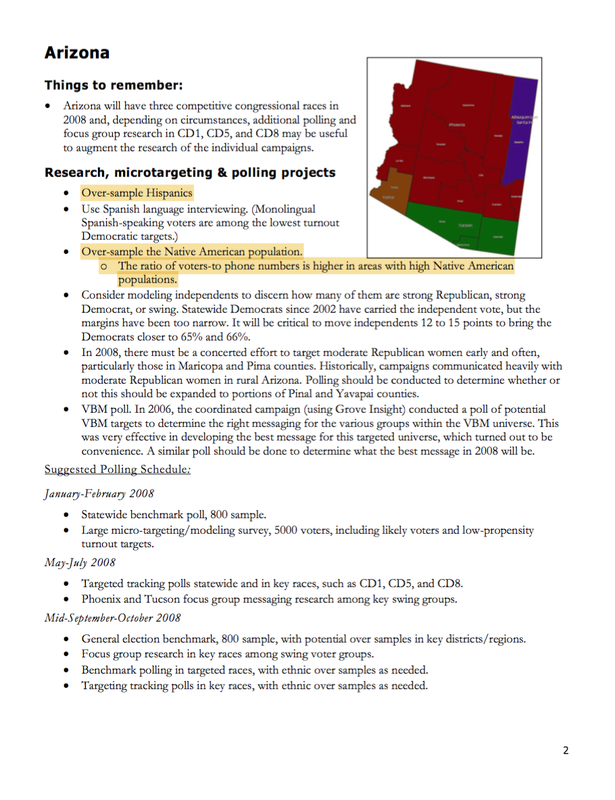 In this document, the authors provide us with a roadmap that could be used to skew polling numbers for Arizona, Colorado, Florida, Iowa, Michigan, Minnesota, Missouri, Nevada, New Hampshire, New Mexico, Ohio, Pennsylvania, Virginia, West Virginia and Wisconsin. Note that, according to Politico, Colorado, Iowa, New Hampshire, Florida, Nevada and Ohio are considered the seven states which are most likely to be contested in a general election (i.e. they are considered swing states). In many cases, the outcome in these states will determine the winner of a presidential election as was found during the 2000 contested election which boiled down to the outcome in Florida. Note the use of the word "oversample". 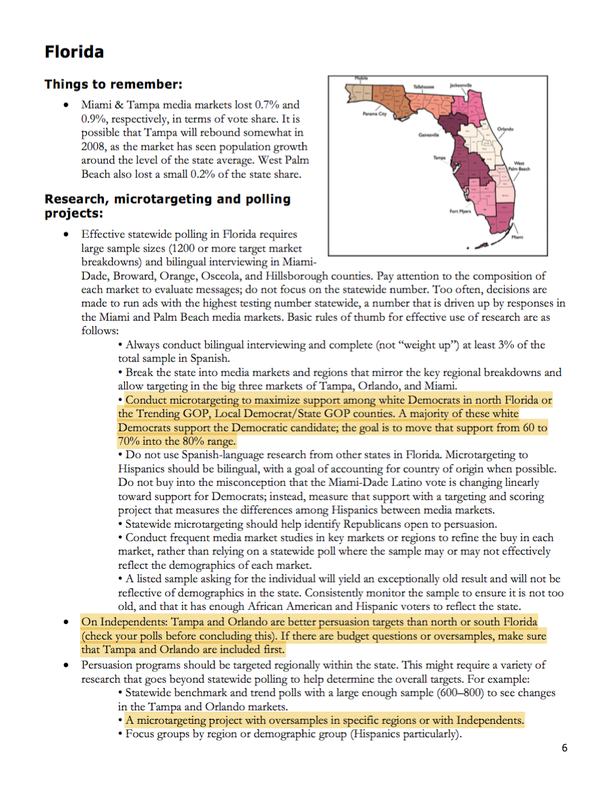 By oversampling in particular regions or among particular racial/ethnic groups, the final polling result can be impacted in a desired direction (i.e. support for the Democrats and support for Hillary Clinton in this case). Note the use of the word "oversample". 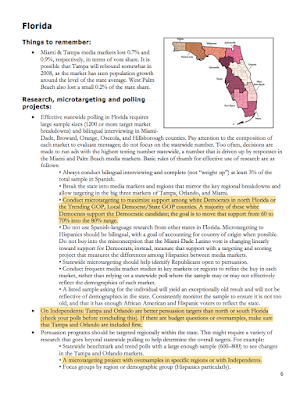 As well as oversampling, in Florida, pollsters were to make certain that the sample was "...not too old and that it has enough African American and Hispanic voters to reflect the state". Again, note the use of the word "oversample". Again, the authors of the report recommend oversampling, however, in this case they recommend oversampling of both Hispanics and Native Americans. 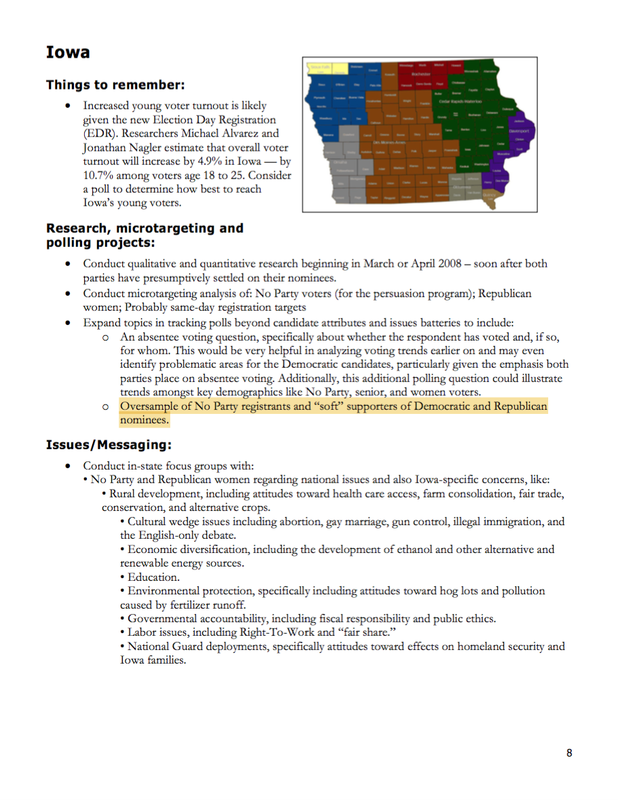 While this example of poll skewing comes from the Democrat playbook, you can see how political campaign teams can use various "under-the-table" methods to affect the results of pollsters. It is these polling results that are picked up by the mainstream media, generally with very little analysis, and are then broadcast to the voting public who quite often take them at face value. As I noted above, this can have a significant impact on voters and voter turnout and can also impact one's political opponents. Apparently, all is fair in American politics and the Podesta emails are giving us a fascinating glimpse of what lengths political campaigns are willing to go to to win. While pondering the sorry state of politics in America as the presidential election draws ever nearer it occurred to me this contest may very well be decided in the last waning days of the process. Several reasons exist as to why voters may pivot at the last moment and even surprise themselves. The bottom-line is that we should not be surprised if this election is decided it its final days because in our fast-paced world many voters seem to remember only what happened yesterday. More reasons this may go down to the wire in the article below. Well-written piece, but your logic fails from the start in your basic misunderstanding of the term "oversampling". I certainly agree that surveys in general may be skewed in a number of ways, including how the very questions on the survey are constructed (garbage in = garbage out). Oversampling is a way to correct for a bias in the original data set, in other words to "balance" the data set so that the results are NOT skewed. 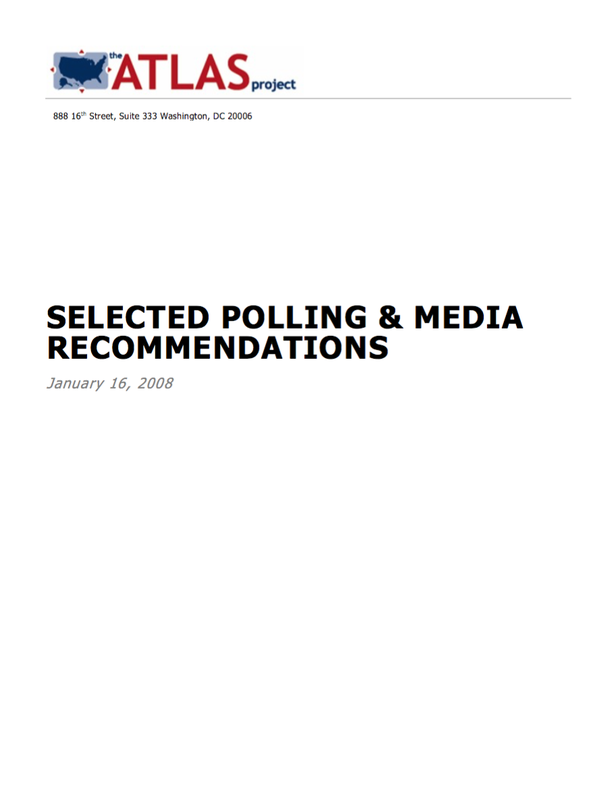 I did not see anything in your highlighted report that indicated that oversampling was being contemplated to produce false polling results. In fact it is the opposite. If you survey 200 people at a boxing match where there are 100 men and 50 women, the data may be biased because your data results will skew towards the opinions of the men. An oversampling technique may correct for the inherent bias in the data set by counting the responses of the women twice, thereby balancing the two demographics. Oversampling may also help reduce the cost of a poll, as in Move-on.org's request to "maximize what [they] get out of [their] media polling." Polling is extremely expensive. MoveOn wants ACCURATE results for the least money, so oversampling techniques will allow for a smaller data set (cheaper) but one that will provide a more accurate and meaningful result. While your points are valid and over- and under-sampling can be used to prevent bias, I think that if you read the lines in context, they seem to point to very, very specific types of oversampling (i.e. in Florida, they wanted to oversample in specific regions or with Independents and in Iowa, they wanted to oversample No Party registrants and "soft supporters of Democratic and Republican nominees". That sounds more like introducing bias than reducing bias to me. Thanks for taking the time to read my blog and make a comment.